Dimensions 1.25 by 9.25 by 11 in. A companion volume to the summer 2007 release of Spider-Man 3 offers an exclusive collection of concept art, sketches, on-set and behind-the-scenes photographs, script and meeting notes, journal entries, and production details, bringing together more than five hundred illustrations in full color with a detailed discussion of the creative process behind the film. 12,500 first printing. 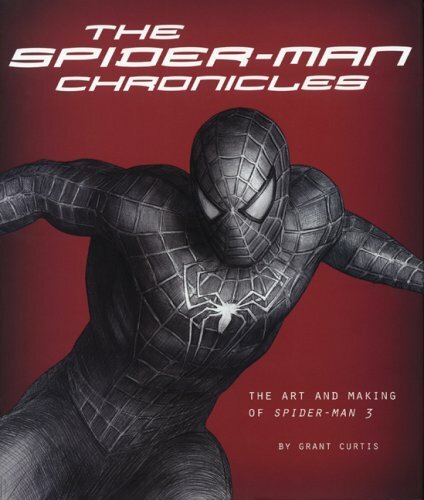 Amazon.com description: Product Description: In The Spider-Man Chronicles, author and Spider-Man 3 producer Grant Curtis provides unmatched insider access to the devoted Spider-Man fan. Curtis has hand selected a phenomenal collection of unpublished concept art, sketches, models, and his own behind-the-scenes photography, and pairs these brilliant visuals with his detailed account of how the film was made from the story and casting to the costumes, production, and special effects. Everything that the serious fan wants is here: early story notes on Vulture, who was later replaced by Venom; shooting locations in Los Angeles, New York, Cleveland, and elsewhere; the real world materials and computer wizardry that brought Sandman to life; transforming Spider-Man's suit into something darker, more sinister, and otherworldly; and much more. Contributions from the key players, including director Sam Raimi, the production designers, costume designers, and visual effects technicians complete this celebration of a groundbreaking motion picture. Spider-Man, the Character: TM & 2007 Marvel Characters, Inc. Spider-Man 3, the Movie: 2007 Columbia Pictures Industries, Inc. All rights reserved. About: A companion volume to the motion picture 'Spider-Man 3' offers a look at the concept art, sketches, photographs, script and meeting notes, journal entries, production details, and creative process behind the film.